A few months ago, I wrote a series of blog posts based on the history of my great great great great great great great great great grandfather, Pieter Claesen Wyckoff. 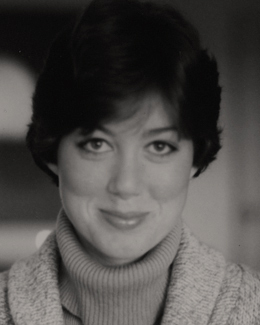 The following is a consolidation of those posts into one story, with a few revisions from the original posts. I’ve stayed as close as I can to available historical evidence, but I’ve also used a bit of imagination in telling the story. Special thanks to the folks at the Wyckoff Farmhouse Museum for their help with historical details. When I heard that Hurricane Sandy was going to hit the east coast, I had all the same fears as everyone else. Will this be another Katrina? How many lives and livelihoods will be lost? Is this just the first of a series of coast-bashing storms, courtesy of global climate change? But, when Sandy headed toward New York City, my concerns zeroed in on a patch of ground in Brooklyn. 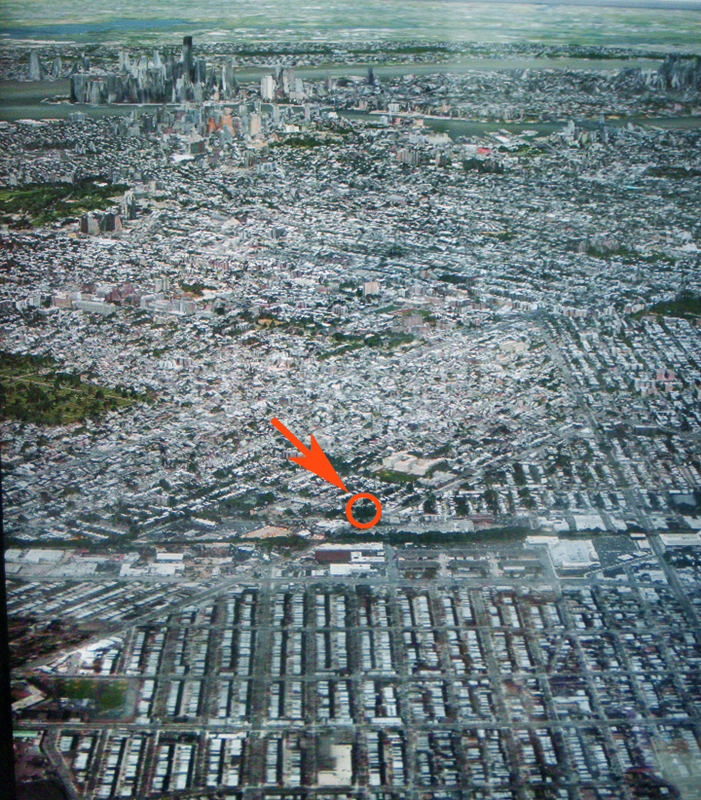 Apple Map view looking down on Brooklyn with Manhattan in the distance. It’s an unassuming little place—a triangle-shaped lot on a busy corner, surrounded by junkyards, check-cashing stores, car repair shops and fast-food joints. Surprisingly, in the middle of this rather homely urban setting, is a tiny oasis of leafy green space surrounded by tall trees and filled with garden plots and lawn. Tucked toward the back of the property sits a small, plain farmhouse. Officially, it holds the honor of being the Oldest Structure in the City of New York, and it’s a National Historic Landmark. It’s also my ancestral homestead. In 1652, my great-great-great-great-great-great-great-great-great grandparents, Pieter Claesen Wyckoff and his wife Grietje Van Ness, moved to this house. The following is a story—based on available historical evidence—of Pieter and how he came to live in this little house. It’s the year 1636, and a young teenage boy huddles in the damp, stuffy hold of a Dutch sailing ship. They’ve had bad weather since the voyage began, but this is the worst. The howling wind and the crashing waves muffle the shouts and curses of the crew up on deck. The boy clutches tightly to his bunk as the ship pitches and dives. The hold is packed with 38 passengers, most of them whimpering and praying. Many are children traveling with parents or other relatives. Unlike them, the boy is traveling alone. Crossing the Atlantic in the 17th century was a dangerous ordeal. The last few years had been hard. The endless wars crippled Father’s trading business, and they had been forced into bankruptcy. Then, when Mother died, Father seemed to lose his mind for a while. Things had fallen apart quickly after that. One day, a man in a fancy carriage had come through the countryside, smiling and offering his gold-leafed ledger to anyone who looked his way. “Sign here,” the man said, “and you will be set for life. A New World awaits—a paradise filled with riches. It only takes six or seven years…then you’ll be free forever.” He held out a quill pen temptingly. Father had bowed to the man, accepted the ledger, and stood for a moment examining it. Then, his eyes brimming with tears, he handed the book to his son. Many immigrants in the 17th and 18th centuries came to the New World in such a way—as indentured servants or contract laborers. Many of them were under the age of eighteen. Some came with their families and were sent out to their stations upon arrival. Others made the treacherous crossing by themselves. Imagine leaving your home, family, and friends to undertake a risky ocean crossing to an unknown world…knowing you would likely never return. What would motivate such a drastic life-choice? Desperation, adventure, hope, despair? My great great great great great great great great great grandfather Pieter Claesen Wyckoff spent much of his childhood as an indentured laborer. Little is known about his life before he made his Atlantic crossing to the New World, other than that he was born in Norden in Lower Saxony (now Germany) and his father was named Claes. We will probably never know for certain why Pieter left on a ship bound for the New World—or if he made the trip alone or with family. But we do have the ship’s log from the voyage, and can read first-hand the captain’s descriptions of the entire trip. In 1636, when Pieter was a young teenager, he left Texxel (near Amsterdam) on the Dutch Ship Rensselaerswyck. There were 38 passengers on board, many of whom were signed as indentured laborers or contract farmers to a wealthy Dutch diamond merchant named Kiliaen Van Rensselaer. 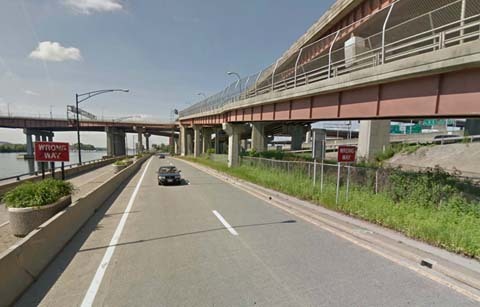 They were on their way to Fort Orange (Albany, New York) and the settlement—also called Rensselaerswyck. The entire trip took over six months. “In the morning, the wind changed to the west. It blew so hard that…we could not carry a single sail….There blew a violent gale from the northwest and we then drifted east with a very rough sea. 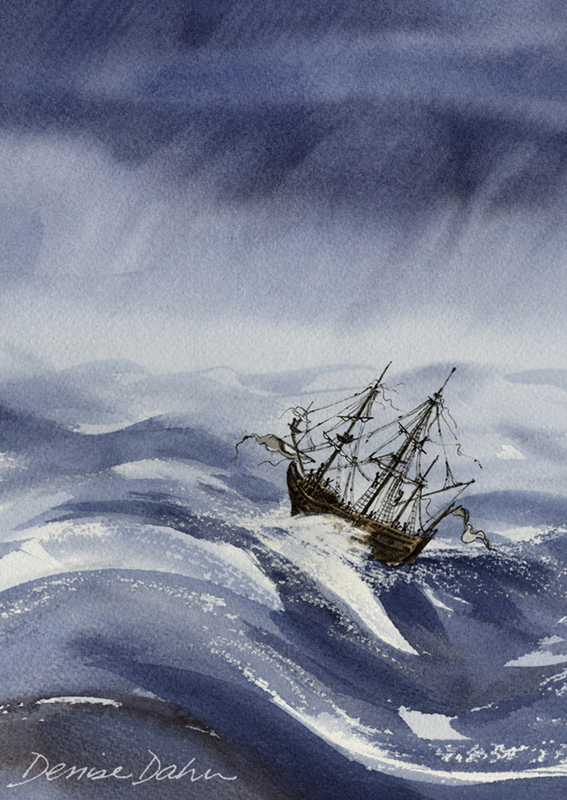 The waves rose to such an awful height that the waves and the sky seemed one…it lasted the entire night.” – Ships’ log, Tuesday, Oct 21, 1636. “That day the overhang above our rudder was knocked in by severe storm. This day a child was born on the ship, and named Storm, (Albertsz Van der Zee) the mother is Annetie Barents.” Ship’s log, Sunday, Nov 2, 1636. They finally decided to reverse course and wait out the bad weather in England. “Seeing little hope of getting better wind and weather soon – though God knows – having few provisions for 52 or 53 souls…we could oppose it no longer…on account of the sick people whose number increase daily because of their hardships…put the helm hard up and steer in God’s name toward the English Channel and try to get into Falmouth or Plymouth…” Thursday, Nov 6, 1936. Several weeks later, they pulled into harbor at Ilfracombe, Devon, where they found several other battered and lost ships also taking refuge from the weather. They stayed here for five weeks, until finally setting sail on January 9th, 1637. After months at sea, finally reaching New York Harbor must have seemed like sailing into heaven for the passengers of the Ship Rensselaerswyck. It was March 4th, 1637—more than sixth months after the ship had left the Netherlands. 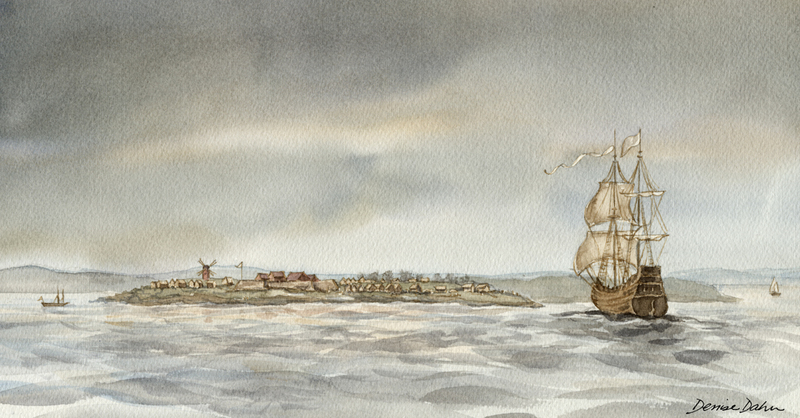 I sketched this watercolor showing how New Amsterdam (New York) might have looked in 1637. 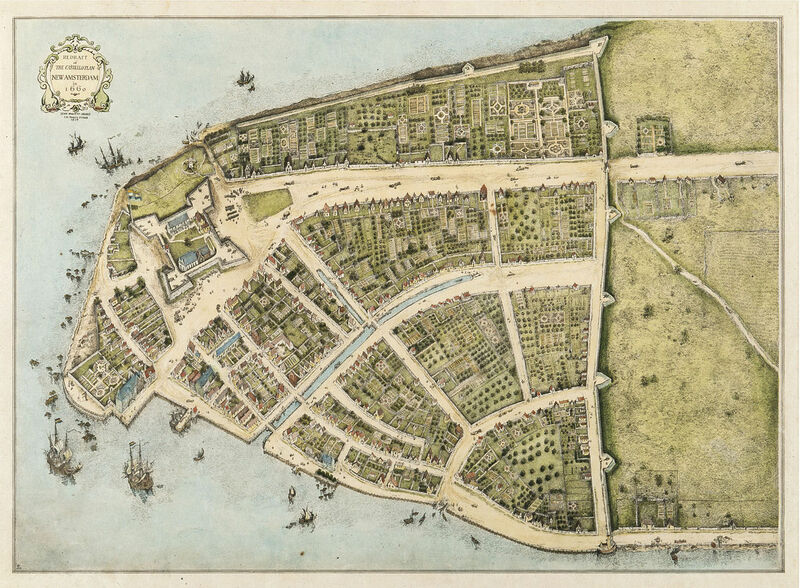 At that time, New Amsterdam was still years from becoming the neatly laid out Dutch village shown in historical illustrations (most of them depicting the view twenty years later). The ship in the foreground is the Rensselaerswyck (I could not find definite reference for the ship itself, but there’s a good chance it was a Dutch fluyt). Click on the picture to get a larger view. Fort Amsterdam and a windmill stood on a small hill surrounded by a scattering of rough buildings. There was no proper pier—people arriving by ship would have been rowed to the shallows to splash up the muddy shore on foot. It was a primitive settlement, and the few hundred inhabitants surely had no idea of the growth spurt their little town would undergo in the next few decades—let alone that this lonely outpost would one day be the financial center of the entire world. 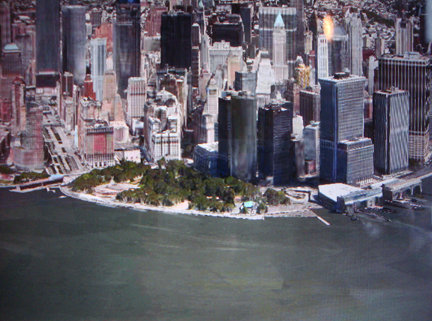 An AppleMap view of the original site of New Amsterdam – today Wall Street in lower Manhattan. The Fort was located behind Battery Park. I imagine that young Pieter would have been greatly excited to finally reach New Amsterdam. It is apparent from his later achievements in life that Pieter was intelligent, strong, gregarious, and lucky. He was a born survivor, and this was the New World. After being so long at sea, it must have been a relief to stand on dry ground once again. The group of passengers probably made their way up to the Fort to be received by the director-general of the West India Company, who must have been overjoyed at their safe arrival. They spent the next few weeks in New Amsterdam waiting for the Hudson River to thaw before they could continue upriver to Fort Orange. I wonder…would Pieter and the other children been allowed to ramble around, exploring the beaches and woodlands, the little farms, and the town itself? What would they have found in the crude little shops, or the bakery, stables, or blacksmith? Did they peek inside the little church…or the tavern? The captains’ log mentions another ship in the harbor—an English vessel. The waterfront might have been busy with cargo being loaded and unloaded, the muddy streets bustling with strange faces speaking foreign languages. 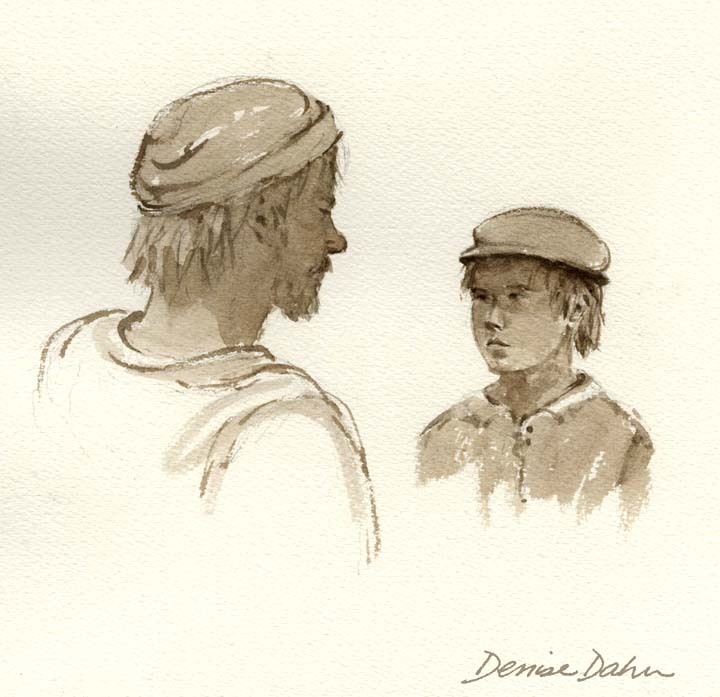 There could have been African slaves in town, and there were almost certainly Native Americans meeting and trading with the townspeople. It must have been strange and exciting, and perhaps a little frightening. After a spending a few weeks in New Amsterdam, the Ship Rensselaerswyck sailed up the Hudson River on the last 150 miles of its journey. On April 7, 1637, they reached Fort Orange—a tiny fortified settlement that had been hacked out of the towering pines a decade or so earlier. It was the last outpost of Dutch civilization. To young Pieter and his fellow passengers, it must have seemed farther away than the moon. A rough watercolor sketch I did from imagination, showing the view from the banks of the Hudson River looking south toward Fort Orange (present day Albany). The entire fort was enclosed by a wooden palisade. 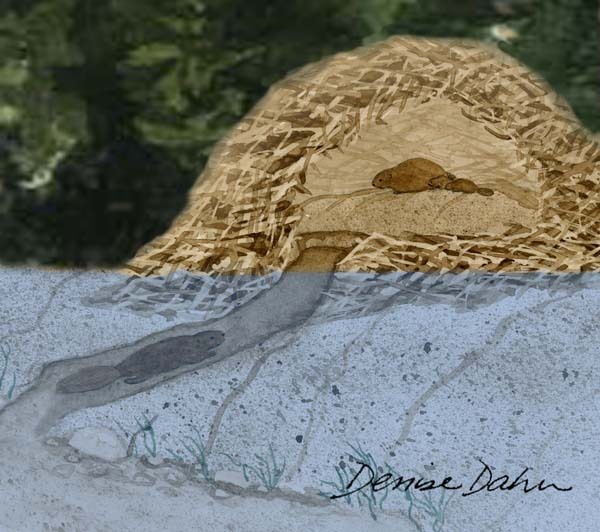 Outside the fort, there was a scattering of dwellings on the river bank. This is the view from roughly the same spot today. Behind the fort, millions of square miles of wilderness sprawled across the continent, inhabited by the Native Americans that had lived there for thousands of years, and hordes of wild animals, birds and fish and other creatures. The location of the fort along the river was key—the waterways were the main travel routes for both wildlife and the people that hunted them. The Europeans were astonished at the abundance of fish and game in New Netherlands. Elk, bear, mountain lions and wolves were abundant in the area. 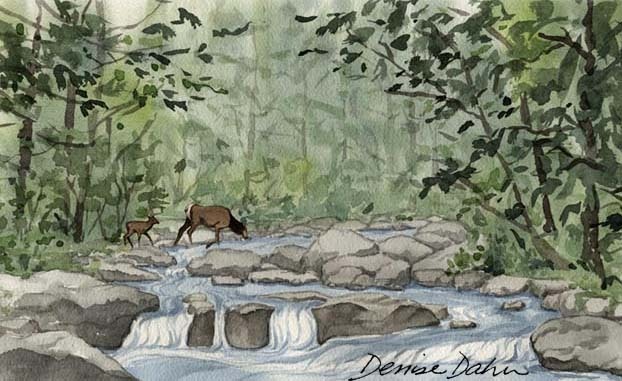 The only game animal with a larger population today is the whitetail deer. He would have been surprised to know it stretches for several thousand miles! It would have been an appropriate name. 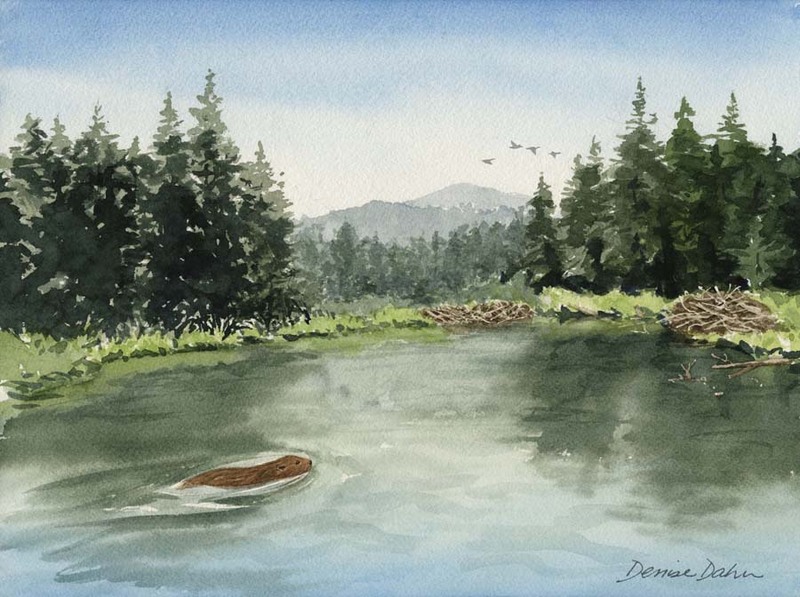 After all, beavers were the re-landscapers of much of North America’s terrain, transforming entire watersheds and creating millions of wetlands which were rich habitat for countless other species. Unlike mink or river otters, beavers are vegetarians. Their preferred foods are the succulent leaves, twigs and bark of small trees. Both Indians and settlers thought beavers were the tastiest meat on the continent, and the best part was the tail. Beavers were responsible for much of the wetland habitat in North America. At one end of the pond is the dam, and nearby on the bank is the lodge. Both are well-constructed of sticks, logs, mud and leaves. The lodge has a secret underwater entrance—cleverly hidden from land predators like wolves, coyotes, or mountain lions. Beavers were also the main reason for early European exploration and settlement of North America. Europeans—especially the prosperous Dutch in Amsterdam—were wild for fashionable, expensive beaver fur hats, and beaver pelts became a medium of currency, forming the economic base of the New World. 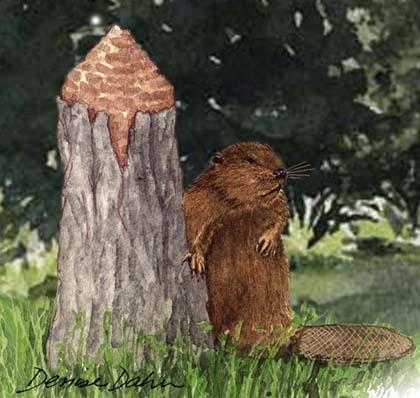 The main business at Fort Orange was beaver. The Mohawk tribe hunted the animals throughout the highlands and brought down thousands of pelts to be traded for European axes, kettles, glassware, knives, and before long, guns and alcohol. Eventually, beavers were hunted to the brink of extirpation. 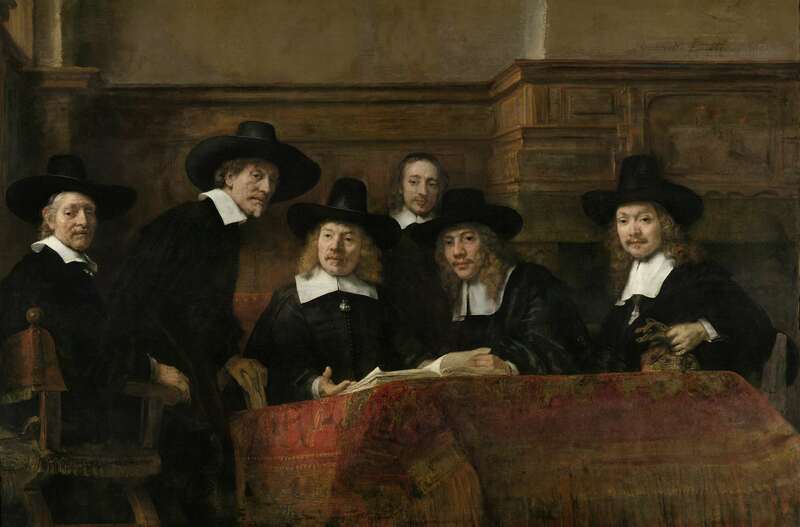 This painting from 1662 shows wealthy Dutch businessmen wearing beaver felt hats. Rembrandt van Rijn, courtesy of the Rijkes Museum. Simon Walischen was a Master Farmer and a lease-holder with van Rensselaer. He was favored by being given his choice of the laborers on the boat, and he chose Pieter. As master, Simon would have total control over Pieter’s life for the next six years. In addition to Pieter, there may have been other laborers assigned to Simon. A watercolor sketch I did imagining Pieter facing his new master. After arriving at the Fort, they would have left by rowboat or small sailboat to Simon’s assigned land, a large tract of previously cleared land on what is now Papscanee Island in Albany. I did this watercolor sketch imagining the type of house they would have lived in. 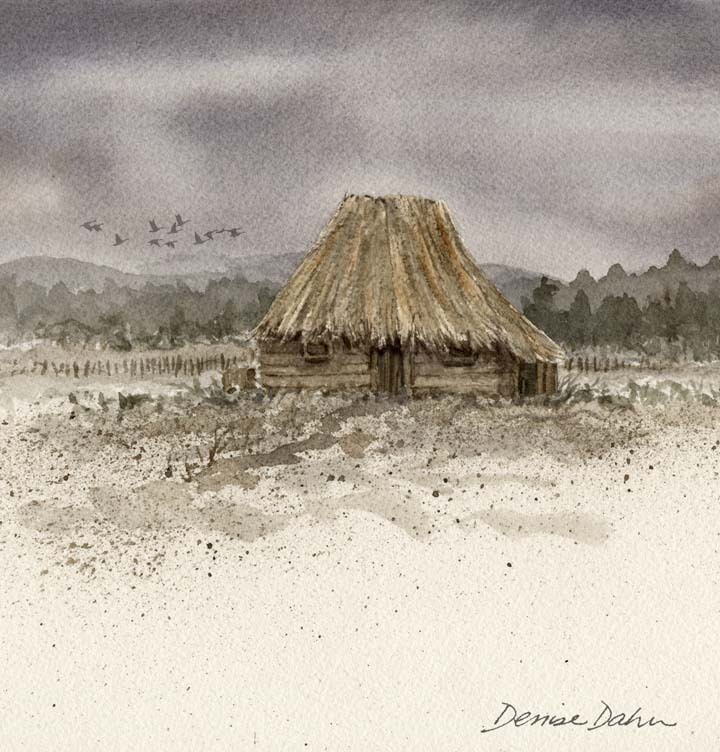 These types of primitive dwellings had no chimney—the smoke simply rose out from gaps in the thatch. At least initially, they probably lived in a crude pithouse with a roof of planks or logs. Eventually they might have built a log and thatch hut, or even a small plank house. I wonder…most of the settlers had wives, and if Simon was married, did the couple share the house with their servants, or did they build a separate dwelling for them? Pieter stayed with Simon until the age of eighteen, then he collected his wages (a total of 375 guilders for 6 years) and left to rent his own farm on the Rensselaerswyck estate. 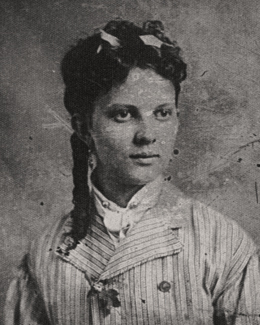 He married Grietje Van Ness, the daughter of a prominent family, and later the two moved— possibly to a location near New Amsterdam or elsewhere on lower Manhatten Island. At that time, New Amsterdam was a growing trading and port settlement, controlled by the Dutch. The map below shows New Amsterdam a few decades later, in 1660. The Castello Plan, a map from 1660 that shows a detailed depiction of New Amsterdam. Today, this is lower Manhattan, the financial and government center of New York City. You can see the layout of Fort Amsterdam, built in 1625 by the Dutch on the upper left side of the town. On the right side of town is the wall, officially built to protect against attack by the Indians, or “wilden” as they were called. Wall Street takes its name from this wall. Image from Creative Commons. 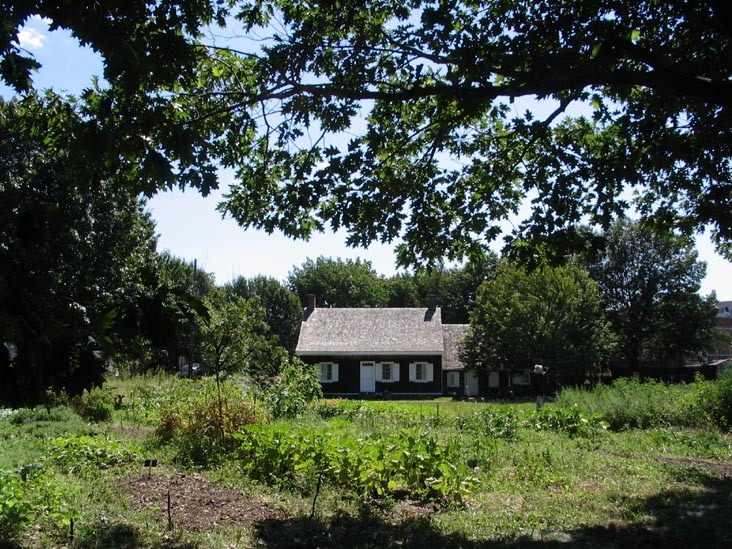 In 1652, Pieter signed a contract to “superintend the Bowery and cattle of Pieter Stuyvesant in New Amersfoort” (Flatbush, Brooklyn)—which was a West India Company- owned tract— and Pieter and Grietje moved to what is now known as the Wyckoff Homestead and Farm, the oldest structure in New York City and a National Historic Landmark. In the mid 1600s Brooklyn and the rest of Long Island was still mostly wild country. There was a small settlement called New Amersfoort—centered a couple of miles to the southwest—that had been started about 20 years earlier as a farming community. At the time Pieter, Grietje and their 3 children moved in (they ended up with 11 kids eventually!) there were about 15 settlers living in New Amersfoort. 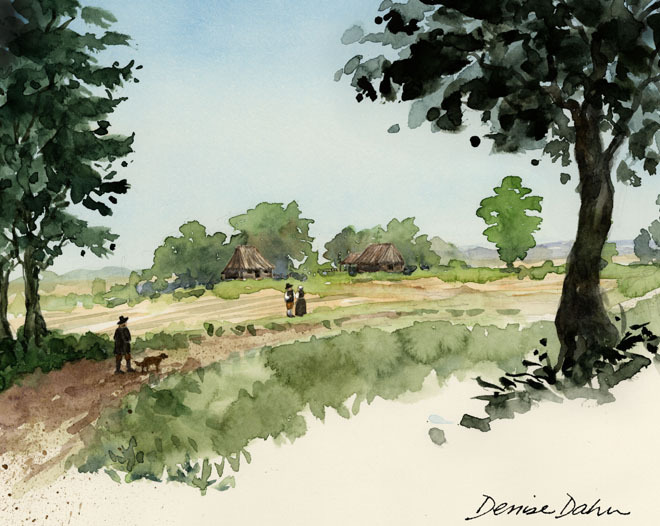 I did this watercolor sketch imagining what Pieter’s farm might have looked like in the 1650s. At that time the house (now the Wyckoff Farmhouse Museum) would have been a small, simple thatched hut. There may also have been a barn or hay barracks, a pigsty and other outbuldings. At first, they probably grew mostly grain. Pieter became one of the most prosperous and influential citizens, buying land, serving as magistrate, and helping establish the Flatlands Dutch Reformed Church (now the juncture of Flatbush Avenue and King’s Highway). He adopted the invented name “Wyckoff” when the British took over New Amsterdam. Pieter and Grietje had eleven children, all of whom married, had children and went on to live somewhat prosperous lives. In 1609, Henry Hudson was sent by the Dutch East India Company to explore the area for a Northwest Passage—a shortcut to Asia. 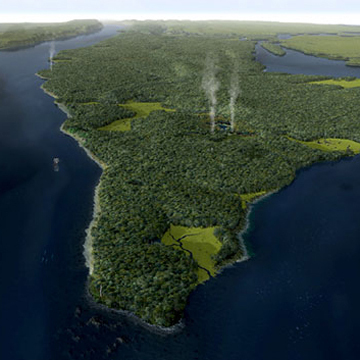 Instead he found the Island of Manhattan (shown below) and the North River (now the Hudson River, on the left). 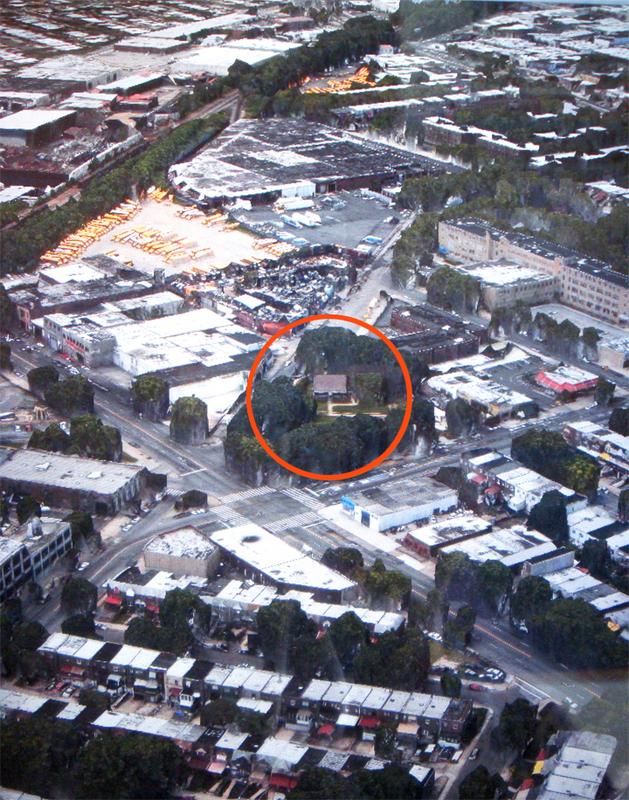 At that time, Manhattan Island was a densely wooded wilderness. There were Native American villages and patches of open meadow which may have been maintained for hunting and gathering by intentional burning. Today, this is one of the most intensively transformed landscapes on the planet. 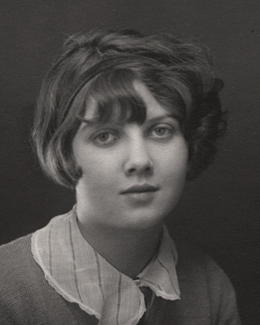 I wonder what Pieter and Grietje would think if they could see it now. 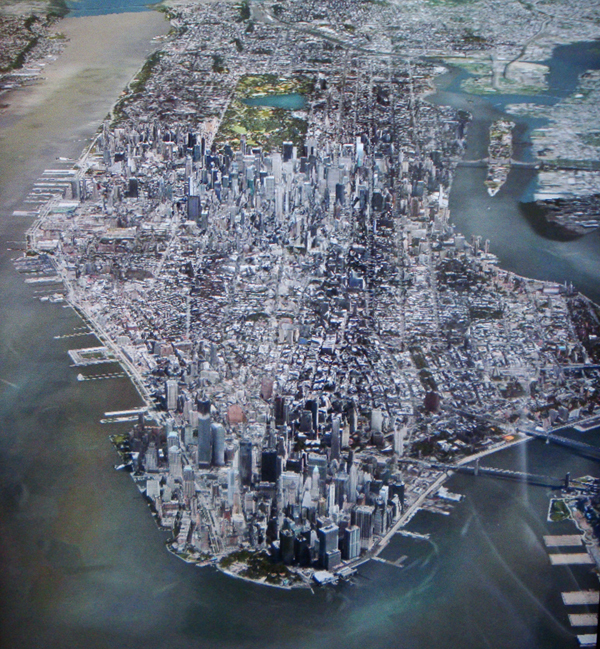 An Apple Maps view of the southern tip of Manhattan. 1. “A Description of New Netherlands”, pages 6 and 70, by Adrian van der Donck, first published in 1655, and re-translated by Dederik W. Goedhuys. 2. “Dutch and English on the Hudson”, by Maud Wilder Goodwin, 1919, quoting Augustus H. Van Buren in the Proceedings of the New York Historical Society. “A Description of New Netherland”, by Adriaen van der Donck and first published in 1655. Newly translated by Diederik Willem Goedhuys. The Rise of Pieter Claessen Wyckoff, Social Mobility on the Colonial Frontier, by Mortom Wagman. 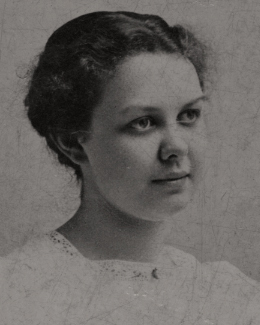 The Wyckoff Families of Old Canarsie Lane, by Mae Lubizt. 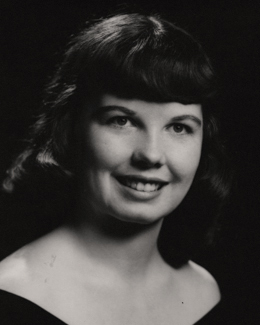 Are you related to the Wyckoff family? Have you visited the Wyckoff Farm and Museum, or other interesting Dutch Heritage sites around New York? Never miss another post…be a subscriber. It’s FREE and you’ll get an email notifying you of each new post! See subscriber button on my home page.